I don’t drink nearly as much coffee as I used to. In fact, I stopped drinking it altogether in September for about three months and found that I wasn’t craving it anymore (and I used to really crave it!). There are so many other drinks you can have these days instead of coffee, I didn’t feel like I was missing it much. But there are some days you just want a coffee. So that’s when I make a latte at home with a bit of coffee. I prefer to make my lattes at home most of the time because I can add in some ingredients that pack a nutritional punch (no sugary syrups for me please!). 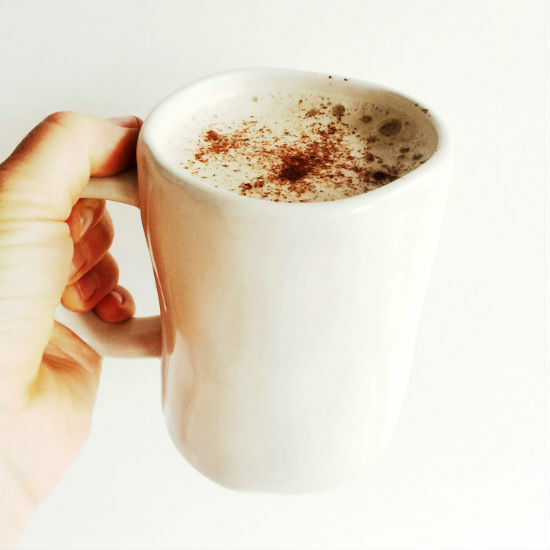 This is a great way to make a healthier latte at home using coconut milk. Blend all of the ingredients in a blender, pour and enjoy! Collagen is the richest form of protein that is found in so many areas of our bodies including our blood cells, muscles, tendons (keeping those joint lubricated! ), skin and it also assists our digestive system.1 We need collagen in our bodies for it to work optimally, but it starts to diminish as we age so we need to keep adding it in our diets whether it’s through a supplement or by sipping on bone broth. One tablespoon of collagen powder provides about six grams of protein which also makes it a great addition to your post-workout smoothies. “What Is Collagen? 7 Ways Collagen Can Boost Your Health.” Dr. Axe. N.p., 28 Mar. 2017. Web. <https://draxe.com/what-is-collagen/>.